Tap left: Pols Renault FT tanks o the Pols 1st Tank Regiment during the Battle o Dyneburg, Januar 1920. Below left: Pols an Ukrainian truips in Kiev, Kiev Offensive (1920) Khreshchatyk, 7 Mey 1920. Tap richt: Pols Schwarzlose M.07/12 MG nest during the Battle o Radzymin, August 1920. 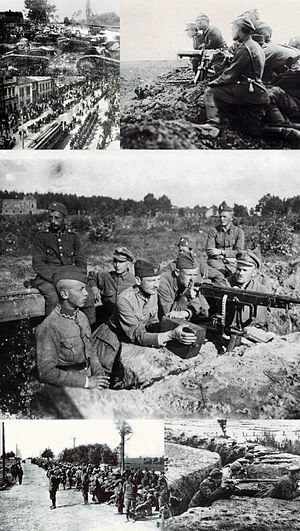 Middle: Polish defences with a machine gun position near Miłosna, in the veelage o Janki, Battle o Warsaw, August 1920. Bottom left: Roushie preesoners on the road atween Radzymin an Warsaw efter the attack o the Red Airmy on Warsaw. Bottom richt: Pols defensive fichting poseetions on Belaroushie, Battle o Niemen, September 1920. The Pols–Soviet War (Februar 1919 – Mairch 1921) wis an airmed conflict that pittit Soviet Roushie an Soviet Ukraine against the Seicont Pols Republic an the Ukrainian Fowkrepublic ower the control o an aurie equivalent tae the day's Ukraine an pairts o modren-day Belaroushie. ↑ NDAP 2004 Offeecial Pols govrenment note aboot 2004 Rezmar, Karpus an Matveev book. ↑ 9.0 9.1 9.2 (in Pols) Karpus, Zbigniew, Alexandrowicz Stanisław, Waldemar Rezmer, Zwycięzcy za drutami. Jeńcy polscy w niewoli (1919–1922). Dokumenty i materiały (Victors Behind Barbed Wire: Polish Prisoners of War, 1919–1922: Documents and materials), Toruń, Wydawnictwo Uniwersytetu Mikołaja Kopernika w Toruniu, 1995, ISBN 978-83-231-0627-2.